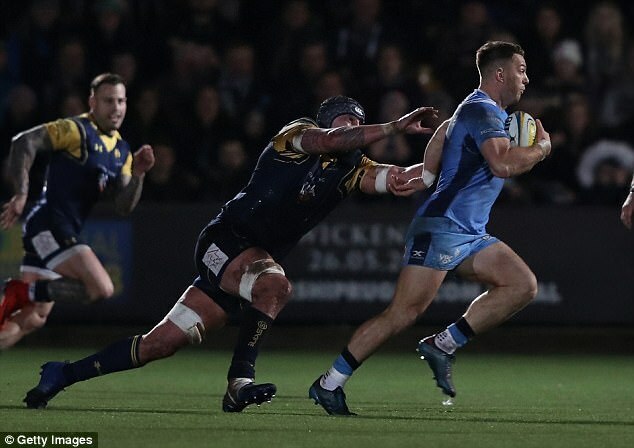 Welsh winger Josh Adams scored twice as his Worcester side saw off a dismal London Irish in a key relegation clash at Sixways. Nick Kennedy’s Irish team battled hard but looked utterly ineffective going forward – worrying given the Exiles’ main problems up until this game had been in defence. A lengthy Irish injury list was worsened before kick off, as captain Fergus Mulchrone and talismanic front-rower Ben Franks were ruled out through injury having failed late fitness tests. A lively Sixways crowd were delighted with their sides’ start, though London Irish were architects of their own downfall. A misplaced pass from Australian Ben Meehan fell in front of four different forwards. Each one of them flirted with claiming the ball, but referee Wayne Barnes adjudged that a knock-on had taken place in the process. From the resulting scrum, Ryan Mills chipped the ball over an onrushing defence, and Josh Adams was able to outpace full-back Greig Tonks to score in the corner. Pennell converted, and a penalty later on in the half meant that Irish faced a 10-0 deficit just before the interval. But flying winger Alex Lewington, who has been a rare source of light in a struggle of a season for London Irish, dotted down in the corner to reduce Worcester’s lead to just two points. After multiple lateral attacking phases, Lewington received a scrappy pass, and running backwards and sideways, managed to find a gap in the Warriors defence. He kicked the ball through, and ran through the traffic to beat Adams to the ball and score. Kennedy and his coaching team would’ve been kicking themselves, as Adams scored his second on the stroke of half time. From a line-out just outside the Irish 22, the Welsh flyer sped through the defensive line, before jinking his way past Cokanasiga and Tom Fowlie to score. The second period was largely uneventful – two Chris Pennell penalties the only scores. It was marked by a series of niggly indisciplines from a passionate Irish team. Too many of their players are losing their heads under the intense pressure of playing for their future. Irish flooded forward in the last ten minutes, but the game was gone, and the Worcester defence held strong regardless. The gap between the two sides is now ten points, and the Exiles have a huge gap to overturn in the second half of the season if they’re to avoid another season away from the top flight. Previous Post Where did it all go wrong for Paul Clement? On this blog, I’m attempting to build a portfolio of published work to aid any possible future foray into journalism, as well as combining writing with school work. I’d be delighted for any feedback on my writing, but I would ask if you could not be too vitriolic with any criticism of an opinion I hold!